Learn how to address sacroiliac pain through a simple approach that focuses on muscle imbalances and weakness. 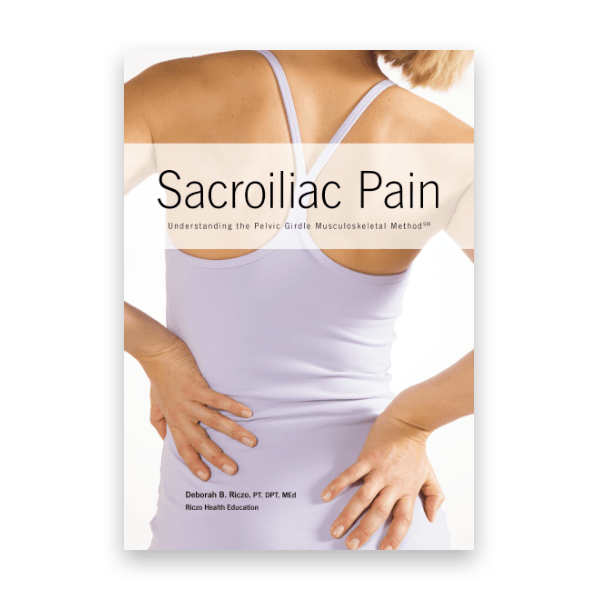 This book provides basic education, screening guidelines, and exercises for those affected by sacroiliac dysfunction. It introduces the Pelvic Girdle Musculoskeletal MethodSM, a program that empowers individuals to monitor their symptoms and address them with exercises that focus on muscle imbalances and weakness, helping to improve day-to-day functioning and overall quality of life. Includes access to online videos demonstrating exercises as well as an exercise planner for logging workouts. Written by Deborah B. Riczo, PT, DPT, MEd. Learn more about sacroiliac pain on author Deborah Riczo’s blog. As both a physical therapist and a person with a history of sacroiliac dysfunction (SD), I highly recommend this book. Dr. Riczo’s method for treating SD is easy to understand and provides step by step guidance. I certainly wish I had access to this book when I was dealing with my own sacroiliac pain in pregnancy and postpartum. I had the pleasure of attending the course that goes with this book and have used this method since. I was super excited to see a book come out that puts it all at my fingertips. I highly recommend this method and book for clinicians to help deal with that ever bothersome SI joint. Thank You Deb for a great resource. Over the past 15 years as a CRRN, I have witnessed the outstanding results of specific physical therapy exercise routines directed to alleviate symptoms related to a particular dysfunction. After having the opportunity to review Dr. Riczo’ s recent book on sacroiliac pain, I now have a better working knowledge and ability to understand the effects of treatment for sacroiliac dysfunction and the utilization of Dr. Riczo’ s recommended method. The anatomical illustrations along with explanations and step by step guide to the various stretches and exercises were easy to understand and foster the motivation to improve the quality of one’s life. I highly recommend this book to both healthcare professionals and their patients who are suffering from sacroiliac pain. This book provides very thorough information for the individual with sacroiliac pain. It includes detailed explanations and images of anatomy as well as appropriate exercises, including modifications. Thanks go out to Dr. Riczo for putting so much of her time and effort into working with this patient population . Her accumulated knowledge is now available in this user friendly book for both therapists and patients. This is a well-designed book and an easy read. You can almost hear Dr. Deb Riczo’s calm and encouraging voice through the pages. I believe this is an excellent tool for post-partum mothers who cannot necessarily find the time to come to physical therapy appointments regularly. This book is also an excellent resource for patients with chronic pain, as the language in the book is upbeat and the over-arching theme is about choosing fitness for life. It offers many variations of the exercises, which makes adherence much easier. The exercise log in the back of the book helps with organization. I will definitely recommend this book to patients with sacroiliac dysfunction. This book is for lay people who want to heal and professionals who lack this information. This book provides valuable information to identify whether or not you have a sacroiliac dysfunction (SD) and gives step by step exercises with clear pictures and illustrations for guidance on how to successfully treat yourself. It is backed by years of evaluation and treatment experience as well as medical science. The section on anatomy is a great review and specific to SD for professionals and people experiencing SD. Dr. Riczo presents on this topic nationally, influencing young and not so young professionals on this little talked about topic. It is easy to use and yet, full of information.